After getting over the initial learning curves of django's forms, I've begun to really appreciate the level of customizability the developers have incorporated into the API. By default, when sending a model to a form, any DateField members are converted to form DateField instances, which translates to a simple textfield. This isn't very attractive and quickly leads to formatting complaints from users (and supervisors). There's another widget django provides for picking dates--three comboboxes for month, date, and year--but it's not a very elegant solution. 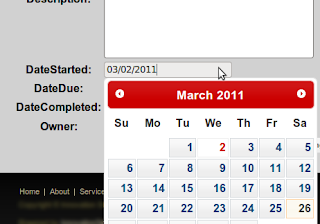 I thought it would be nice if, by default, all my forms could use jQuery UI's datepicker. Here's what I did. First, after some searching online, it seemed several people have experienced similar issues. I happened to run across this answer on stackoverflow for customizing widgets for all forms. First, on ProjectForm I specify a custom callback function for handling form fields. This is actually really nice as I can apply this code to any form I want instead of marking individual fields for a form or applying the entire fix to every single model. In make_custom_datefield I do a quick check to see if it's a model DateField instance. If it is, I do some modifying. First, I change the format of the widget so incoming data from the model match jQuery's format. It might be possible to modify jQuery to match Django, but whatever. Then I add on two custom attributes to the widget. Both of these directly map to html attributes of the input tag. The datePicker class is important so I can mark this input as a jQuery calendar in the browser. I also mark it as readonly so users can't modify the date with bad formats. Marking the input as read-only is a double-edged sword as it also prevents users from quickly entering dates months or years away. And that's it! I can now make jQuery UI datepickers the default widget on any django form I choose. Very helpful for a new Django user thanks! This worked like a charm and was the clearest explanation I have found online so far. Thanks! I found bug when U use a widgets property in modelform. I solve this by using send **kwargs to formfield constructor. I think it is simpler to use the widgets meta in your ProjectForm. Thanks for the detailed conclusion to your(?) slashdot question. I wouldn't have been able to go from the general code on the answer to your final solution easily. your code is very useful to me..
please share the entire code. I am beginner of django understanding very useful to me. Sleek! Worked right away! 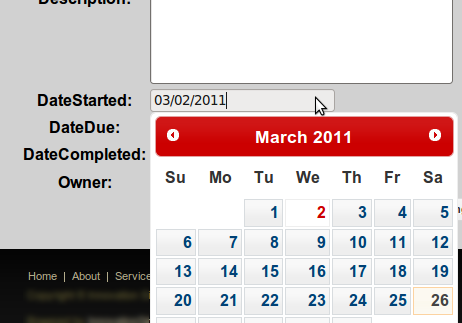 Though I customised jQuery UI's datepicker. So far I have placed the custom function in the models.py file in my app. Any idea what would be a better place to put this function? Learning Django is not easy, if you want to do amazing things. I found your post looking for a jquery renderer for django forms. It is amazing how you gave a solution for a very common issue. Thank you for this! It came in very handy for me! For any others who happen across this, I've added a wee bit of js using bootstrap so that a nice clickable calendar icon appears in the form field. Looks awesome!